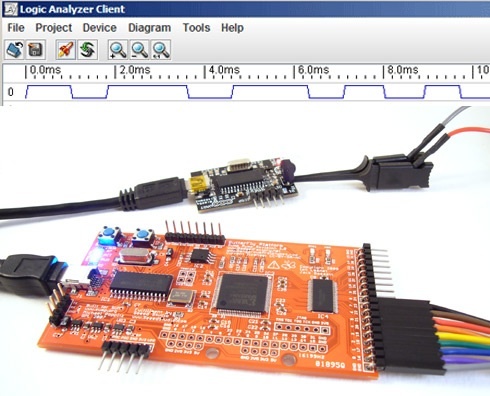 Prototype: Openbench Logic Sniffer logic analyzer « Adafruit Industries – Makers, hackers, artists, designers and engineers! Prototype: Openbench Logic Sniffer logic analyzer @ Dangerous Prototypes – nicely done Ian, and Jack Gassett at the Gadget Factory as well as all involved! Openbench Logic Sniffer is an open source logic analyzer. It’s designed to support the SUMP logic analyzer software at the lowest possible cost. Download the source and design files from the Gadget Factory project page. This project started in the comments on a post. Initial circuit design, PCB layout, development, and testing continued in the forum under the code name Project SUMP PUMP. Many, many people contributed ideas and advice, the Gadget Factory and Dangerous Prototypes coordinated circuit development and routed the PCB. We borrowed heavily from the Gadget Factory’s Butterfly Platform. You can get your own assembled Open Logic Sniffer at Seeed Studio for $45, including worldwide shipping. Continue reading about the design and collaboration below. Thanks for the post! Don’t forget Jack Gassett at the Gadget Factory. It was a team effort, and a ton of other brilliant people lent their experience and insight to the effort. Just Pre-ordered one.. Looking forward to giving it a try! Great price for a hobbyist!